Have you heard about Rialto Jean Project yet? No? Well, that should change—stat. RJP is a sustainable jean project that donates a portion of their sales to benefit children's art programs…specifically, the Children's Hospital Los Angeles and New York Presbyterian Child Life Services, which use their art programs to help children learn to cope with their hospitalization and illness by expressing themselves through a variety of art forms and therapies (the Children's Hospital says it best—read about their programs here). I can't exactly remember how I first stumbled across RJP—I have a feeling it could have been through Jean Stories, a really great denim blog, or any other number of sites I work my way through during the day, but I know I was hooked right away. 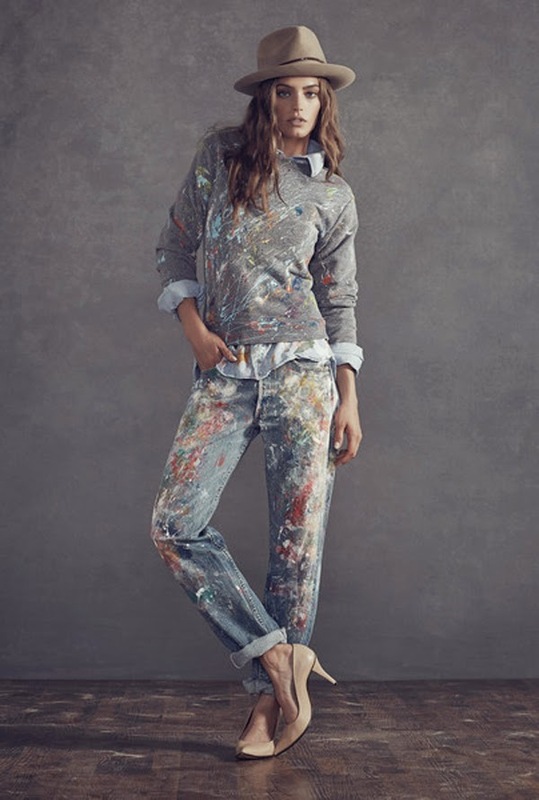 It's not exactly a secret that I don't shy away from color (although my wardrobe has gotten more neutral-friendly over the last year) and I'm often found in a great jean whenever possible, so I love the vibrant, paint-splattered palette. Erin Feniger, the creator of RJP, selects high-quality vintage jeans (think Levi's, Gap, Paige, 7 for All Mankind etc.) in a variety of washes and styles, from traditional blue flares to pink skinnies and distressed boyfriends. The jeans run between $200-$245, and if you're in NYC you can see even more styles at their pop-up shop at 206 Front Street in South Street Seaport. Thinking I need to get a boyfriend style first. Which pair is your favorite? all images via Rialto Jean Project. Shop the entire collection here!